Pros: My favourite place to write in London by far, mostly for the creative buzz and the views of the river when I look up from my laptop. Free wi-fi. Plenty of space. Snacks and an affordable menu if you get peckish. Nobody cares, or notices, if you spend the whole day nursing only a single cup of coffee. The bar upstairs at the BFI is great too. It's only getting a brief mention here though because I'm not a big fan of sofas to work at (I just want to curl up and read a book), and you can't see the river. Cons: It gets VERY busy after work hours and on the weekends. I know many people are bothered by noise when working - I'm actually fine with it - but I'm not so much of a fan of people reading my work over my shoulder when it gets so full that I have to share my table. Headphones and brightness setting on laptop at lowest recommended for night owls like me. Pros: Oh, it’s just so gorgeous - I want to live here! Incredibly hip and, well, it’s called The Book Club, which of course makes it the perfect place to write. Free wi-fi. Loads of events, workshops etc on in the evenings - worth keeping an eye on the schedule. Cons: It gets very busy. Sometimes closes during the day for events - or at least it did on one particular day that I turned up raring to get writing. If you’re easily distracted (and not alone) then the ping-pong tables won’t help. Pros: As their flagship store, this is the only Starbucks of its kind in London. A cool seating area, comfy sofas and brick walls - it really feels like you should be writing a book in there. Lots of other people who look like writers (we didn’t ask) which adds to the whole literary feel. Fine to stay all day just drinking coffee (er, perhaps stating the obvious there). Food is well-priced - important if you’re going to be eating there every day. Cons: The seating area is downstairs in the basement, so not somewhere you’re going to want to work in if the sun happens to come out. It gets very full so you’ll probably end up sharing your sofa and table with the lunchtime crowd. Oh yeah, and it doesn’t serve Diet Coke - so that was that for me. Pros: Designed for working - there’s free wi-fi, sockets galore, and too many tables to count. The wall of books behind glass is beautiful and reminds you that you are in a library (you could be forgiven for thinking you were sitting in an Apple store). If writer’s block strikes, there’s always an interesting literary exhibition or two to get you inspired. Good food, well-priced. Cons: There really aren’t any cons. For me, it’s a bit inconvenient travel-wise, otherwise I’d probably be here every day. Pros: Proper pub, loads of original features and some particularly lovely green tiles. Free wi-fi. A few very comfy booths with plenty of space to spread your work out. 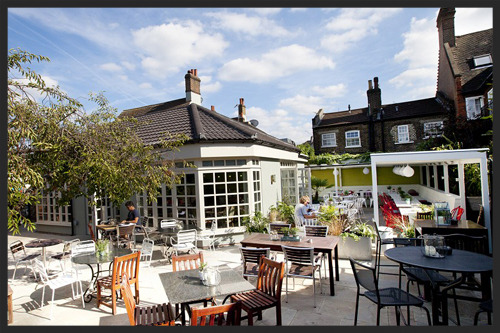 Lovely beer garden if you prefer to take your writing outside. When it’s not busy, it is the perfect place to work in. Cons: Gets incredibly busy and noisy during lunch and after work hours - even headphones don’t help. If you're the sort of person that feels obliged to do stuff, then you're going to feel obliged to buy food when you and your coffee are taking up a whole booth and everyone trying to find a seat for lunch is - understandably - eyeing you with daggers. Pros: Free wi-fi. Great food and coffee at very reasonable prices. Plenty of sockets to charge up the laptop. Hip, warehouse style with a bicycle repair shop inside, which only adds to the cool vibe of the place. And possibly handy too if you're cycling there. Cons: Really noisy and full most of the time. The constant stream of people means the door is always opening and closing which, on cold days, means everybody at the front of the place is sitting with their jackets on (fix - sit at the back). 7. The Booking Office Bar, Kings Cross. Pros: Beautiful, imposing and awe-inspiring. It’s the perfect setting in which to write in and, if you’re into armchairs, you won’t find a finer collection. Despite its considerable cons, it really is worth visiting at least the once. Cons: No free-wifi. The staff (and others who have been say the same), are just rude. Very pricey. They turned us away at 9.30am, even though the place was empty, as they only allow hotel guests in before 10 for breakfast. Pros: It's in the South West of London, which is a considerable pro if you live in the South West of London. It has plenty of space - I've never had a problem finding a table, and it's very nice and all inside. 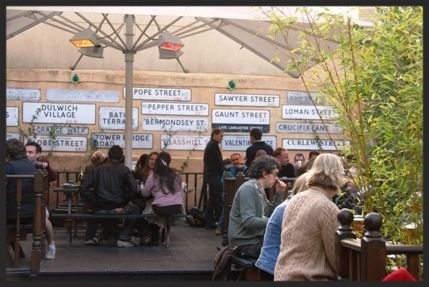 However, the reason this pub makes it onto this list is the beer garden - it's GORGEOUS. Covered area, blankets to wrap yourself up in and sockets outdoors. Seriously, this is a winner. Or it would be, if it was closer to me. However, it's on my way to my mum's house, so I'll often leave early just to get some work done here first. It's worth it. Free wi-fi, good food, lovely staff. Highly recommended for those who live in the area, or who have mothers who live in the area. Cons: It's not next to a station. It's not far, about a 15 minute walk or so from Putney Bridge, a few minutes more to Putney Rail and East Putney. Metered parking, so it's not really an option for drivers before 6.30pm. Pros: It has a creative office feel about it, perfect for that moment when you get really serious about finishing your book, and the bookshop is there to remind you of the direction in which your hard work is heading. Cool lighting (you can’t tell from the photo, but take my word for it) and free wi-fi too. Cons: Like all the best places, it gets really busy, particularly during lunch hours. There’s no music and a lot of talking so headphones are a must. If you’re a morning person (I’m not), then you might not like the fact that it doesn’t open until 10am. Pros: My friend's latest discovery, and a winner for us both. Feels like it's been designed for the purposes of working and sitting all day. It's got wi-fi, plug sockets, comfy seating, and the buzz of people working all around you. Looks good - kind of a modern NYC feel to it, and seconds away from Shoreditch High Street Station. Food is great and reasonably priced, though it would probably break the bank if you ate every meal here day in, day out. But that would be true of anywhere in London really. Cons: Not easy to get a table if you arrive during lunch hours. My suggestion; get there early. That's all I've got - otherwise, it's the perfect spot to work.